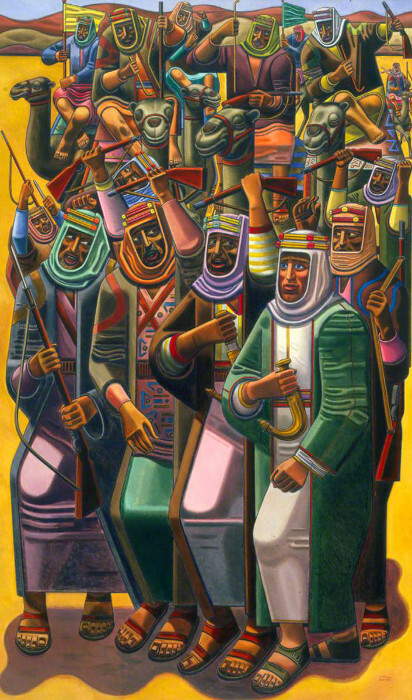 T. E. Lawrence with a party of Arabs  a return to subject matter of the 1920s associated with Lawrence's account, in Seven Pillars of Wisdom (1926), of his role in the 191618 Arab Revolt against the Ottoman Empire. 'It was notoriety to be the only clean-shaven one, and I doubled it by wearing always the suspect pure silk, of the whitest (at least outside), with a gold and crimson Meccan head-rope, and gold dagger. By so dressing I staked a claim which Feisal's public consideration of me confirmed'  Seven Pillars of Wisdom, ch. 99. For more about this picture, click here.